While the Brexit story continues, ShipitSmarter continues to stay on top of the news. In regard to the transportation issues with carriers, we would like to inform you on which actions we have taken so far. We are in close contact with the most used carriers, like UPS, DHL, TNT, FedEx and DPD. We discuss with them the impact of a hard Brexit/no deal and the different scenarios on a regularly basis. For instance what does it mean for the interface between ShipitSmarter and the carrier, what about the routing tables, booking messages, carrier labels, services, e-invoices, paperless/paperwork for export shipments etc. The general feedback that we have received from these carriers so far, is that the United Kingdom (GB) will be considered as a dutiable/customs country. The booking message for example will be similar to other Non-EU countries and e-invoices will not change, only custom surcharges may apply. As we are no contracting party, we have asked the carriers if there are any other charges or rates for shipments to or from the UK and if the current zoning and transit times will change. We have not received a clear answer on this yet. We do know that most of the carriers are working on a Brexit manual. 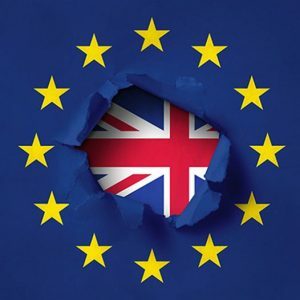 On the ShipitSmarter platform, GB will be added to the Non-EU country table in case of a hard Brexit or no deal, as shipments to the United Kingdom are then considered as export shipments and no longer as EU shipments. This means that a reporting trigger alert will be added, which indicates that documents need to be attached to UK shipments. An extra table will ensure that export-related surcharges are included in the calculation of the tariffs, if applicable. In case the UK will remain in the customs union, and depending on the agreement, documents or surcharges will or will not apply. An overview of specific custom related settings in ShipitSmarter will be shared upon request. In case you have any questions or concerns about your situation, please do not hesitate to contact us, we’re here to help!